Dogs seem to come in all sizes, shapes and color - every kind of personality that a person could imagine. Everyone seems to have their favorite breed. I guess that is good since it gives many dogs opportunities to have great homes and develop special skills. Many breeds perform very important jobs for people. I personally love the mixed breeds since I have seen literally thousands during my years of helping the shelter. They are all still great dogs inside - some are just a little prettier than others! 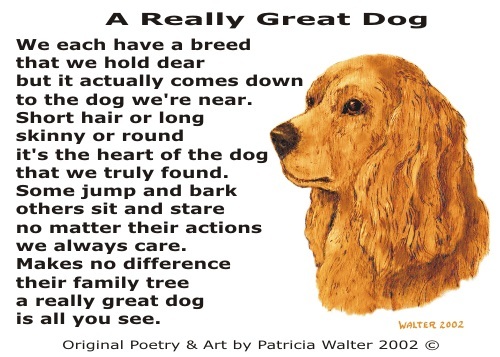 But every dog, no matter their breeding, is a loyal companion giving unconditional love. to the dog we're near.